The other day I went to the grocery store with a partial list, and not my typical coupon organization. It was a last minute decision to stop there on my way home, figuring I’d get it done early. Only, while I was there, I wasn’t paying proper attention to the sale prices verses what coupons I had, and long-story short, I ended up paying $8.00 more than necessary. And this past weekend, I had my hands full while walking through the foyer, and my giant horse of a dog stopped right in front of me. Trying to avoid falling on and over him, injuring us both, I grabbed for the wall, knocking down a ceramic cross wall hanging and breaking it. Then the next day as I was cleaning up my flower beds, I (assume) lost my balance and fell in the road as I tossed out the weeds. I placed my hand down to help break my fall, and for a moment thought I’d broken it. (I could continue this paragraph indefinitely, as I walk into walls, furniture, trip, etc. on an almost hourly basis). Why do I tell you this? (Besides hopefully making you feel a little bit better about yourself) Because I’ve come to realize that I’m always in a hurry. Everything I do is done in urgency. Maybe my impatience plays a hand in this. Or my overwhelmed plate full of tasks. Possibly I’m a careless and haphazard person. Maybe I have attention and focusing issues. Or maybe I’m just lazy. 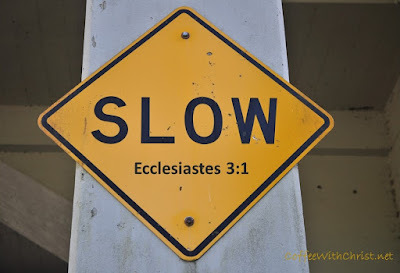 But the lesson I’m learning is that I need to slow down. Why do I have to rush to get everything done? In my hurriedness, I end up making mistakes; mistakes that cost me money, time and energy. If I’d gone slower on the above tasks, I wouldn’t have had to redo my workload twice; I wouldn’t have wasted $8.00; and I wouldn’t have fallen, twice. (Well, yeah, I probably would have- I’m a klutz.) But in my efforts to save time, I wasted it, and so much more.